No, no tears were shed. Not after the kind of season we had. 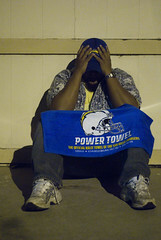 Actually, the last time I shed tears over the Chargers was the last time they faced the Steelers in the playoffs, back in 1995. But that was for the AFC championship and a trip to the Super Bowl that year, which was a first for the Chargers, so those were tears of joy. Yesterday's game was like a distillation of the whole season--poor tackling, poor pass rush, poor pass coverage; Phillip Rivers still had a 105+ passer rating (just about matching his league-leading season average) in spite of the poor pass protection, Darren Sproles still had a bunch of all-purpose yards (although Norv insisted on using him like he was a power running back); poor clock management, and a couple of janky calls (I'm sorry, but that interception the Steelers had touched the ground; it was clear on the replay, so who knows what the referee was looking at. And what did Vincent Jackson do that was considered excessive after his touchdown?). Now, for the Super Bowl? I dunno. I like the Eagles for what they've had to overcome to get to this point. But then I like the Cardinals for Kurt Warner's story; plus Fitzgerald is bloody exciting to watch. I don't really give a rip about the AFC. I guess I'd like to see the Ravens beat the Steelers. Hopefully next season the Chargers can keep the personnel that carried them this far--Darren Sproles being a key player entering free agency. Hopefully LT will be all healed and better than ever. Shawne Merriman will be back with a hunger and a vengance. And the Defense will have a whole off-season and regular season with Def. Coordinator Ron Rivera, who was instrumental in the team's turn around after he was promoted to the position. Can you tell I have feelings about this? Chargers football is one of those things that brings me back to my childhood. One of my fondest memories is staying up late, watching the '81-'82 AFC playoff game against the Miami Dolphins, which went through four overtime periods before the Chargers prevailed. Unfortunately, they had to go from tropical Miami to frigid Cincinnati for the AFC championship, and fell short. One day it'll happen, and San Diego will feel the joy and relief that Boston felt after the Sox finally broke their championship drought. If you read this far, thanks for indulging me.